So I’ve been in a creative mood lately. Making that laundry detergent sort of set off my desire to try making new things, from household goods to crafts to food. I’ve never really been much of a chef, but lately, I’ve made chili, salmon, crab cakes, and quinoa for the first time. Heck, on Saturday morning, Jay & I made bacon and eggs and for the first time ever, I didn’t scrambled them but rather made them sunny side up. This probably doesn’t sound like a big deal at all, but I’ve never had the patience or that gentle touch to cook or bake or start Do-It-Yourself projects. I used to knit back in college and I had a brief sewing phase right after college when I made a couple purses and dresses, but they weren’t that great, lol. Since then, writing has been the major focus of my creative energy. Work and exercise has pretty much sucked up the rest of my energy. I’m at that point where I’ve had too much Internet, TV, and exercise, and am looking for other activities to do in my downtime. Naturally, I’m going to post that stuff on my blog just like I did with the homemade laundry detergent. I can’t guarantee that it will be interesting, but I will do my best. So while I’m in a sharing mood, I figured I’d share my newest obsession, which I know isn’t even a new thing. 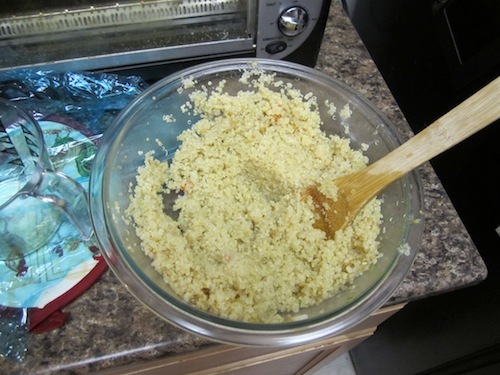 A few months ago, my mom introduced me to the wonders of quinoa, a healthy grain that’s high in protein and amino acids, gluten-free and is an alternative to rice or couscous. It can be used as a small meal, a snack, a side, an addition to a main meal, in soups, salads, breads, puddings, or as a breakfast cereal. You can pick it up at Trader Joe’s or Whole Foods or even at your local grocery store (I found a box at Harris Teeter). It’s not necessarily a low-calorie food, but it’s healthy and it fills me up. It is also easy to digest. I’ve been taking it to work in a little Tupper Ware container to eat for lunch. The recipe my mom taught me was based off of this one. She varied it by not including the green onions or parsley, so that’s what I’ve also been doing. It’s pretty easy to make. My instructions in this blog post will only include what she does in her recipe. 2. 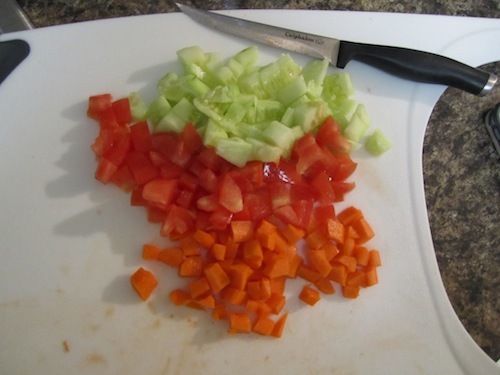 Cut up the tomatoes, carrots, and cucumber. 3. Put the quinoa in a large bowl and mix in the olive oil and lemon juice. 4. Add in the tomatoes, cucumber, and carrots. Sea salt is optional. Stir them all together. 4. Cover the bowl, put it in the refrigerator and let it sit so all the ingredients soak together. I let it sit overnight because then the flavoring is much better, but I think my mom makes hers in the morning and then goes back to it several hours later at lunchtime. 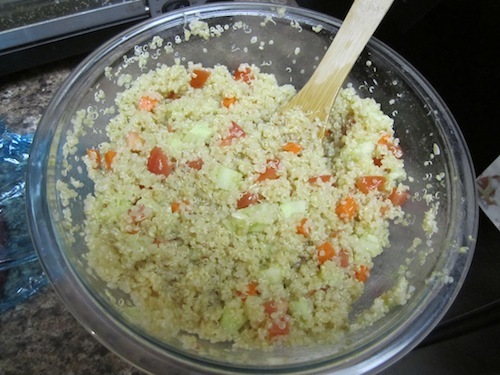 I actually have been compiling more quinoa recipes that I’ve found in various places on the Internet. I made another one last night that I’ll have to share with everyone. Stay tuned! This entry was posted in Arts & Crafts, Food, Health and tagged arts and crafts, Quinoa. Bookmark the permalink.